Ever since, I was in university, I was motivated to start my own company. In 2012, I graduated with Bachelor’s degree from FAST National University, Islambad. Our university offered an incubator program and a couple of my friends were already applying for it. This seemed like a perfect opportunity to give it a try. So me and my friend, Shafaat Javed, applied for an incubation office in our university and we were successful in getting one. We were both fresh graduates and also broke. :D At that time, I used to live in a small apartment and I was barely making the ends meet. While our friends got good jobs in good companies and got salaries like Rs.50k, we didn’t give up, as we both knew that in the beginning you have to make a lot of sacrifices and decided to give our startup a shot. We named our startup, “SA Developers” and we got a nice office in the university premises. My business partner wanted to go for services based company and I wanted to for a product based. I agree, that in the beginning you need some kind of a revenue stream. While I know that most of the startups focus on services in the beginning and then move on to product as time progresses, but, I don’t agree with this logic. I believe that if you commit to something, then you better give it your 100% instead of having safety nets and falling back to them. Some of our seniors did go for service based startups and they did very good also, but it wasn’t something I wanted to do and it isn’t something I would have been proud of at that time. The lines show the cumulative cash positions for two start-up product companies and a start-up service company. The product companies risk more than the service company. 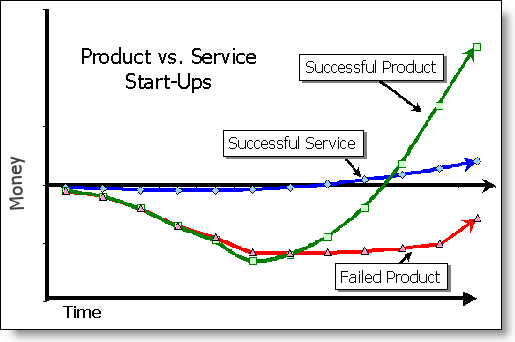 I think that successful products earn more and do better than service based startups in the long run. The chart above shows my point of view in a diagram. Yes, products have a very high risk of failing, but even if the product fails, you learn something from it and may be it helps you build a more successful product in the future. Nevertheless, products give you exposure which you can never achieve with a service based company. Except for a handful of service based startups which are doing well, its hard to get recognition. Most of the time you are just sending your portfolio and begging for projects and negotiating. Also you dont have full command over the project in a service based startup and the requirements are always changing. Not to mention the deadlines. Our problem was also capital, we didn’t have any. As I mentioned in the beginning, we were both broke and because of financial reasons, my co-founder decided to leave for a normal job. After he left, I kept working alone for a few months. I worked on some android products and also I had an ongoing service based work. I too realized that this startup is not going anywhere and after a few months I also found a job. But, I didn’t give up on the dream of my startup and I decided to work two jobs. I got a normal job in the evening shift at MTBC as a Software Engineer for IT, working on ASP.Net with C#. In the morning, I used to go to my own office and in the evening I used to go to my normal job. It continued like this for around 8 months. My normal job took my social life and my startup, my work life balance. This was a recipe for disaster. Soon, almost over a year had passed and our incubation contract was finished and I said goodbye to the startup for now. As with most of the failed startups and incubators, it was also because of capital/money. For me, the biggest regret is not to work on a product. Our incubation was also not sustainable. In the end, I learned a lot from this experience. Disclaimer: All the opinions are my own opinions and I own them.